HAIR COLOURANTS CAN CAUSE SEVERE ALLERGIC REACTIONS. Read and follow instructions. This product is not intended for use on persons under the age of 16. Temporary “black henna” tattoos may increase your risk of allergy. 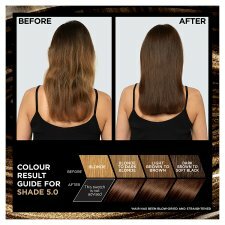 Do not colour your hair if : You have a rash on your face or sensitive, irritated and damaged scalp, You have ever experienced any reaction after colouring your hair. You have experienced a reaction to a temporary “black henna” tattoo in the past. YOU MUST DO AN ALLERGY ALERT TEST WITHOUT FAIL 48 HOURS BEFORE EACH USE OF THIS PRODUCT (read and follow the instruction leaflet). REMEMBER TO BUY THIS PRODUCT IN ADVANCE IN ORDER TO DO THE ALLERGY ALERT TEST 48 HOURS BEFORE USE. 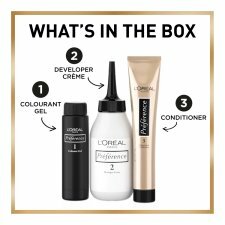 The Developer Creme contains hydrogen peroxide The Colourant Gel contains: phenylenediamines, phenylenediamines (toluenediamines), resorcinol, and ammonia. Avoid contact of the product with eyes. Do not use to dye eyelashes or eyebrows. Rinse eyes immediately and thoroughly if product comes into contact with them. Wear the gloves supplied in the box. Rinse hair well after application. Wait at least 2 weeks after using a relaxer, a perm or a straightening process on the hair. 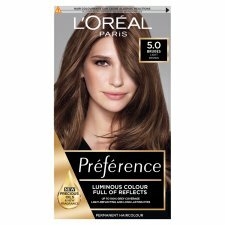 Do not use if your hair has been coloured with henna or with a progressive hair colourant. Keep out of reach of children.